The use of tubular shapes is seen all around us in nature. Tube-like structures are naturally occurring in the bones of animals, bamboo and the stems of flowers. It’s no wonder HSS is so popular amongst structural engineers – from being a cost-effective structural member, to a high strength to weight ratio, to a uniform strength and aesthetically appealing nature, Hollow Structural Sections add strength and beauty to any steel structure. 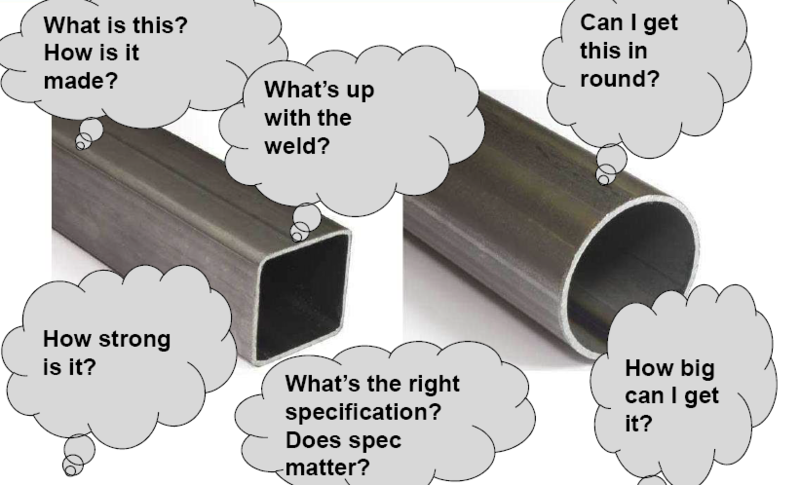 But with all the specifications available for pipe and HSS, how does one choose what’s best for their application? Let’s dive into what exactly HSS are and then review some of the most common specifications that are used today in North America. HSS, or, Hollow Structural Sections, are cold-formed, welded steel tubes used for welded or bolted construction of buildings, bridges, and other structures as well as a wide variety of manufactured products. They are produced in square, round, and rectangular shapes to meet structural design requirements. Historically referred to as TS (tube steel) or ST (steel tubes), Hollow Structural Sections offer several advantages over other structural steel materials, including ease of handling, lower finishing costs, higher strength to weight ratio and excellent torsion resistance. HSS are produced to multiple specs with the most common being ASTM A500, CSA G40.21 and ASTM A1085. ASTM A500 is the most common specification in the United States for structural grade applications including load bearing columns. HSS produced to this spec are cold-formed and welded carbon steel structural tubing in rounds and shapes (squares and rectangles). The most common manufacturing method utilizes the electric resistance welded (ERW) process to create the weld seam. The most common grade of A500 material typically manufactured by HSS producers in North America today is Grade C.
HSS is also produced to the ASTM A1085 specification. Like ASTM A500, HSS manufactured to the ASTM A1085 spec is produced utilizing the electric resistance welded (ERW) process. It offers several advantages over A500 including one minimum yield point for squares, rounds and rectangles (50KSI), better wall thickness tolerances (half of what A500 is) and a standard Charpy V-Notch test that meets AASHTO Zone 2 Fracture Critical Elements. In addition, for seismic design the actual yield stress cannot exceed 70 ksi, which will give a better expected strength and produce ductile designs in accordance with the AISC Seismic Provisions. ASTM A1085 is best used in applications such as bridges, and in seismic zones. In Canada, the common specification for HSS is CSA G40.21. This specification is like ASTM A500 except it has tighter wall thickness tolerances. The wall thickness tolerances in CSA G40.21 are the same as the tolerances in ASTM A1085. CSA G40.21 HSS come in two classes: Class C and Class H. Class C is the typical cold formed and welded HSS while Class H is a heat-treated HSS. Heat treating the HSS in a furnace after it is made relieves some of the residual stresses. The Canadian steel code, CSA S16, allows for a different column curve to be used when calculating the axial strength of Class H HSS. Columns utilizing this have higher allowable axial capacity which leads to more economical designs and cost savings. This just scratches the surface of the HSS specifications that are currently in the marketplace. Want to learn more? I offer a full presentation on HSS Specifications as well as several others – all available for personal development hours! Sign up for one of them today!